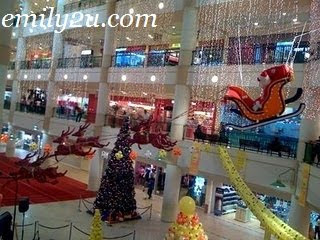 My friend sent me a text message asking which mall in Ipoh has the best Christmas decoration this year. I replied, “None.” I didn’t let him know that despite being teased that I am “Ipoh Mally”, I haven’t been to too many malls around Christmas time to be able to make a fair comparison. Actually, I like this decoration of Santa Claus and his reindeer which hung from the ceiling of the concourse area in Ipoh Parade. Normally, I already like the curtain of hanging lights. 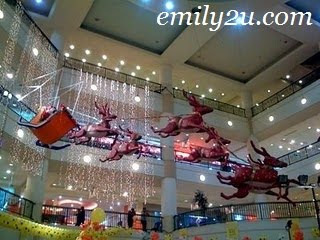 With Santa Claus being pulled by reindeers on his sleigh, it really fits into the Christmas theme. My photos were actually shot quite a few days ago but I was there as well earlier this evening to catch their Christmas Samba and Rumba Dance Performance. There were only three dances performed by two dancers only. Yes, two dancers, three dances, that’s all. Even so, this sort of made up for the disastrous performance last evening even though this couple is also from the same dance school and also performed last evening. It must have been those kids. One Response for "Santa Claus Is Coming To Town"